Note: El Areeb broke his maiden in his third start as a 2-year-old at Laurel Park then won the James F. Lewis III Stakes also at Laurel. 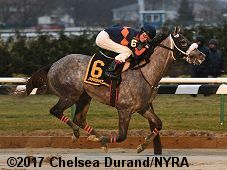 He made his 2017 debut winning the Jerome Stakes (G3) at Aqueduct and followed that up with another win in the Withers Stakes (G3) also at Aqueduct. He disappointed in the Gotham Stakes (G3) finishing third as the 2-5 favorite. On March 30, it was announce he had a bone chip in his right front knee and was off the Triple Crown trail.